In what may have been a masterstroke political play, Councilman Michael Russo stunned the City Council and the public when he pivoted on a decisive vote approving a design vendor for Sinatra Drive: Kimley Horn and Associates in a 5-3 vote. The approval in the end for the 107K design contract pitted Russo on the other side of the Old Guard council where a 4-4 vote would have been sufficient to stop the Administration's RFP selection. The Fund for a Better Waterfront sent in five people to speak against the design firm including Executive Director Ron Hine, Jim Vance and Ines Garcia Keim. Their complaints ranged from questioning the scoring in the RFP process to FBW not being permitted to attend a committee meeting the previous night on the firm selection. Lots of criticism was made especially by Hine about a design plan that did not exist. Not one of the five people speaking on behalf of FBW mentioned their obvious conflict. The organization had a member who submitted a failed bid on this design RFP and last September Jim Vance declined to receive a copy of the design bid according to comments made by Assistant Business Administrator Steven Marks. Marks noted the Fund for a Better Waterfront expressed interest in bidding on the RFP and that he was lobbied by its member Jim Vance to select Craig Whitaker for Sinatra Drive's design earlier. Councilman Dave Mello replied to the slew of FBW speakers it didn't seem proper to have its members appearing at a committee meeting on a potential vendor coming up for a contract vote adding the City could later be criticized for contract steering. Beth Mason looked more bitter than usual especially with the dramatic turnaround where Russo voiced his support and decided to put his money where his mouth is as he put it to extend "more trust" to the Administration. Mason inexplicably spoke against the design firm complaining she had not received information sent to all council members and went into one of her signature incoherent political attacks being caught with her pants down. The problem for Beth Mason was even with her army of paid political operatives and consulting staff, no one told her about the documentation on the RFP selection. (Mason neither reads nor writes her own "stuff.") She went on a rant and said "garbage" was being tossed at the council members. No one came to her aid in her latest self-exposure of incompetence for the second time in as many months. Mason completed her incoherence on the issue voting to abstain, rendering her vote meaningless. firm designated the winner in a scored RFP to redesign Sinatra Drive. The vote was cagey and tactical looking ahead at political realities. Merry Christmas! 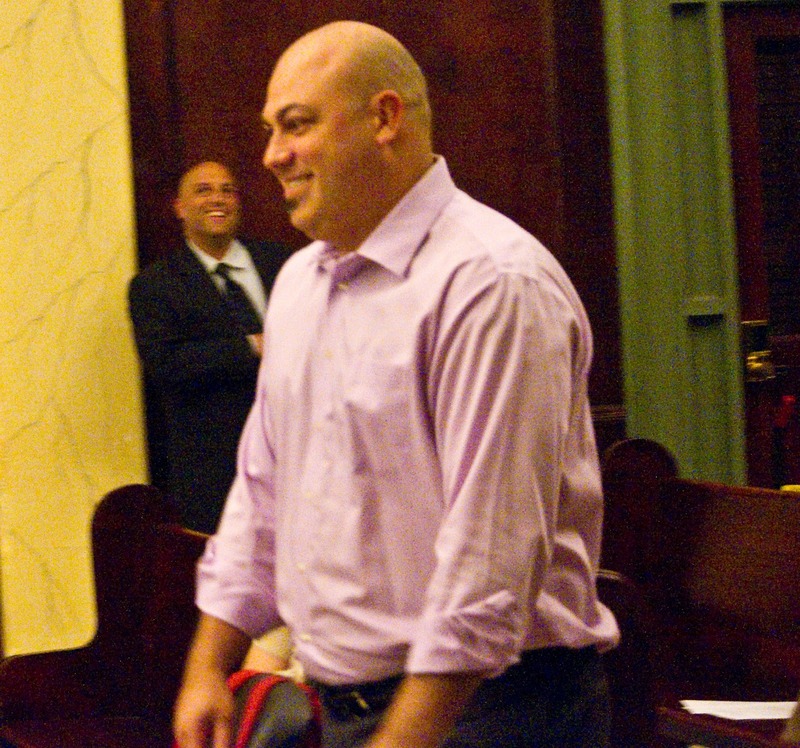 Talking Ed Note: City Clerk Jimmy Farina made an extremely rare comment to the council on the design firm resolution speaking on behalf of the Hoboken Veterans group who voiced strong sentiment against moving the World War II Memorial. He added the matter was discussed among almost two dozen Vets and among them only Jim Vance voiced support to the idea of moving the WWII Memorial from its current waterfront location. Jim Vance concluded his overtime remarks beyond the five minute portion for public speakers by putting on a Veterans hat. Farina was less then impressed with the attempt by Vance suggesting Hoboken Veterans would find the move acceptable. Clearly they do not. Someone may want to pass that along to the $40,000* a year Executive Director of the Fund for a Better Waterfront who has called moving the memorial "an opportunity to build a better WWII memorial, an idea that most (not all) of the Hoboken Vets support." Perhaps he should have checked with City Clerk Farina and the vocal Veterans leadership that has made it clear it would be "over (their) dead body." It's a new day my friends, a new day. * MSV is not confirmed on a 40K or 25K FBW Executive Director Salary past or present.